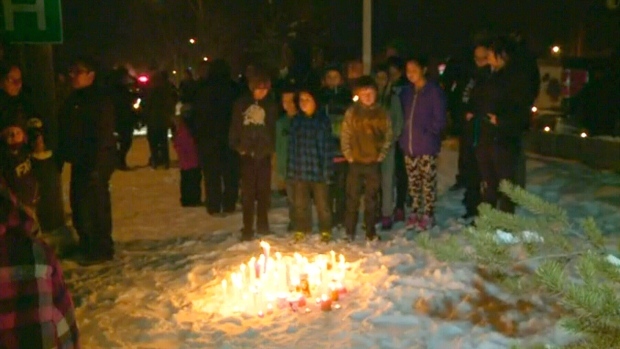 Canadians are offering words of condolence and mourning after a shooter in the northern Saskatchewan town of La Loche killed four and injured others on Friday. Prime Minister Justin Trudeau held an emergency press conference in Davos, Switzerland to speak about the tragedy. "We all grieve with and stand with the community of La Loche and the province of Saskatchewan on this terrible and tragic day," he said Friday. "Obviously this is every parent's worst nightmare." Saskatchewan Premier Brad Wall also released a statement on Facebook about the events, extending his thoughts and prayers to the victims' families, and thanking the emergency crews who attended the scene. "Words cannot express my shock and sorrow at the horrific events today in La Loche," Wall wrote. "My thoughts and prayers are will all the victims, their families and friends and all the people of the community." Other politicians, including interim Conservative Leader Rona Ambrose and NDP Leader Thomas Mulcair also released statements about the shooting. The local La Loche NDP MP Georgina Jolibois, said she was "shaken up" by the shooting, and that members of her family were inside the school at the time of the event. She later confirmed that they were unharmed. Speaking to CTV News Channel, the region's MLA called the shooting "devastating" and described Dene high school, one of two shooting locations, as a "beacon of hope" for the area. "I know from working with them that the school and the staff and the kids were just fantastic. This is just devastating," Buckley Belanger, MLA for Athabasca said. The director of education at the Northern Lights School Division said it is working with the province to bring crisis response teams to the area. "Our entire school and school division community are in shock and in mourning after the tragic events in La Loche today," Ken Ladouceur said in a statement on Facebook. "Our hearts are broken for each of the victims and their families and for all the students and staff at the La Loche Community School." Public Safety Minister Ralph Goodale assured the community that the RCMP and health officials would help cope with the aftermath of the shooting. "(RCMP) Commissioner Paulson is making absolutely sure that the La Loche detachment has everything they need to conduct a proper investigation," Goodale told CTV Regina. "We'll need to make sure they have everything they need in terms of initial supports."